Originally from the Valencia region of Spain & made with rabbit and snails, paella (pie-ay-ya) has been reduced to nothing more than a pilaf mixed with shellfish, chicken & short-grain rice. started with a sumptuous broth of saffron, sofrito, clam juice and chicken thighs, it's a great dish to serve during the holiday season. Heat olive oil in a wide, shallow skillet or paella pan. Sprinkle chicken with salt and pepper. Add chicken and cook over medium heat until brown, about 7 minutes per side. Using tongs, remove chicken from pot. e until beginning to brown, scraping up any browned bits, about 10 minutes. Stir in rice, tomatoes, olives and saffron. Add clam juice and chicken stock to pot and bring mixture to simmer. 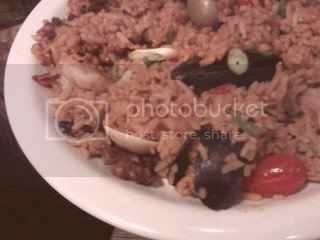 Arrange chicken, shrimp, squid, clams and mussels in rice mixture. Sprinkle with peas. Cover with foil. Cook paella until chicken is cooked through, clams and mussels open and rice is tender, about 45 minutes (discard any clams and mussels that do not open). If needed, add additional water or stock to rice to ensure rice is cooked through. Remove foil and let paella stand 10 minutes. Serve with lemon wedges. I neglected to make a comment earlier about how good it is to see you back blogging again. Glad you have the arm mobility back to make something as grand as paella!